The 1432FA Comby is ADA compliant. Both toilet and lavatory are mounted on 45° from the wall. Fixture is arranged to be installed on finished wall through access panels. Panels are located on front and side of cabinet and are secured with tamper-resistant screws. The comby is designed to meet water conservation. ADA 2010 compliancy and the rigorous demands of security facilities. Please check with local ADA requirements. ADA compliance is subject to proper installation (including devices such as grab bars) and the interpretations of the local code authority. This option provides a grab bar with a closure plate for a 1432 combination fixture making it suicidal resistant. This option provides a grab bar and a lavy closure plate that makes the fixture suicide resistant. 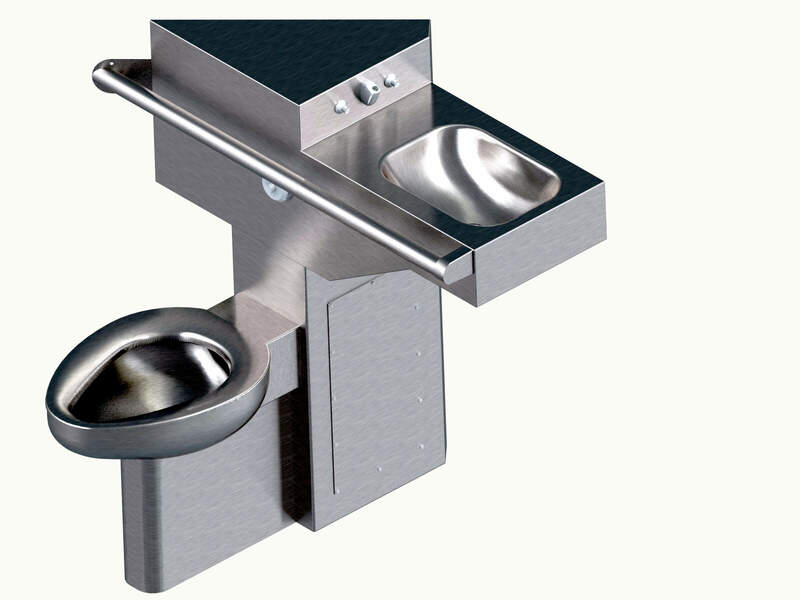 Option -SPS (Ligature Resistant Skirl on Toilet) is recommended to meet Ligature Resistant applications. This option provides the specified fixture without a grab bar. This option allows you to choose a desired length for the lavy waste. The 1432 Comby is ADA compliant. Both toilet and lavatory are mounted 45° from the wall. Fixture is arranged to be installed on finished wall and serviced from an accessible pipe chase.